Written by John Huston and Richard Brooks and directed by John Huston and filmed almost entirely on the backlot of Warner Bros. studios, Key Largo is a intricate character study of people under pressure. Starring Humphrey Bogart, Edward G Robinson, Lauren Bacall, Lionel Barrymore, Claire Trevor and many more excellent actors. We should also count the storm as a character. It plays a big role in setting the circumstances and the mood for everything that goes down in and around Key Largo. So grab some popcorn, close the blinds, and settle in for a trip to southern Florida during hurricane season. Enjoy! There was a radio drama of Key Largo produced by Lux Radio Theater in 1949, starring Edward G. Robinson, Claire Trevor, Dan Seymour, and Edmond O'Brien. 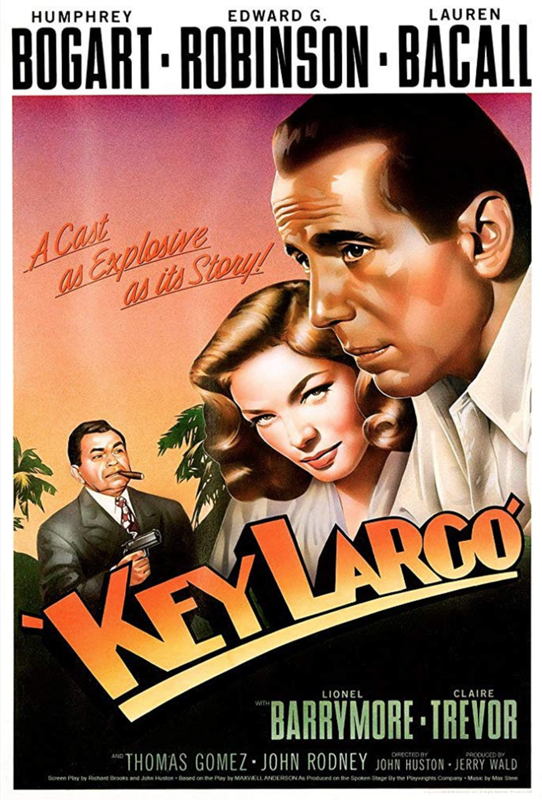 Here's the IMDB page for "Key Largo"
Up next, "Lillies of the Field"